Carlos and Larry drove in Larry’s pickup truck to Iowa City and returned with 20,000 solar powered calculators that had been destined to be scrapped. Rick offered to store them in his warehouse. 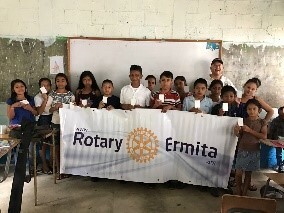 A few more phone calls later to Jorge resulted in a group effort led by ‘Pato’ and ‘Pata’ in Guatemala to receive and distribute the calculators to local schools. One day, Carlos stood in front of his club and asked for donations to pay for the freight, and the calculators were on their way thanks to Rick’s international shipping knowledge. See the results in the photos shown. Full disclosure, Pedro Cevallos Candau is Governor Nominee (DGN) of District 6450 and a member of Rotary One, the first club in the world. Carlos Früm is Past District Governor (PDG) of District 6440, the Home District of Rotary International, and a member of the Rotary Club of Northbrook. John Ockenfels is PDG of District 6000 and a member of the Rotary Club of Iowa City AM. Larry Kanar is Past President of the Rotary Club of Northbrook. Rick Rivkin is Governor of District 6440 and a member of the Rotary Club of Northbrook. 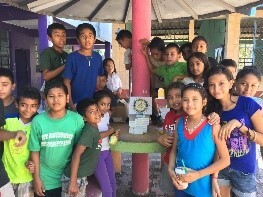 Jorge Aufranc is a Director of Rotary International and a member of the Rotary Club of Guatemala Sur. 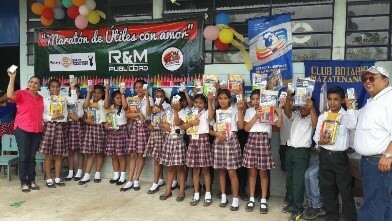 Carlos Ernesto ‘Pato’ Andrade is PDG of District 4250 and a member the Rotary Club of Guatemala Norte. 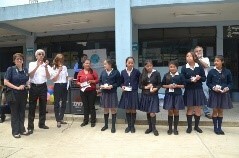 Luz ‘Pata’ Andrade is ‘Pato’s’ wife and President of the Rotary Club of Guatemala Norte.